Tonight you can get your Frankie on and drink to the glow of hot pink at The Sidecar with Brian, Suzanne, and the Sly Fox crew. 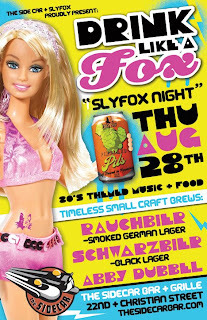 They're promising lots of fun with excellent beer (the likes of which certainly wasn't brewed in Phoenixville in the 80s), neon, music, and food....and maybe even some legwarmers??? The Beer Lass is running things, so the night promises to be a lot of fun...and gentlemen, this is not an IPA-only event! But, I'm betting that some of 'em will be there. Speaking of running... Then, on 9/13, you can run like a fox by joining the Fishtown Beer Runners Club during the River City Festival at Penn Treaty Park along the Delaware River. Now, they may not have a permit for beer during the festival. But, no worries, since (the almost-ready) Yards, Druid's Keep, Standard Tap, and Johnny Brenda's are all just spittin' distance away.